These Oversized Playing Cards are actual decks that are much larger than standard size decks (3-1/2" tall decks). 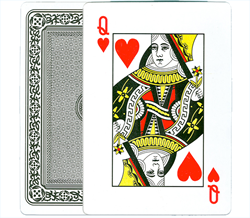 You can choose from Playing Card sizes ranging from 3½" x 5" to 10-1/4" x 14-1/2". The Giant Decks are available in Bicycle, Piatnik, and a number of other styles.